China is generally a very safe place for tourists, however, while travelling in China, there are several tourist scams that visitors should be aware of. If you are going to travel with a trustable travel agent, it will help you to get rid of these tracks, if you going to travel with yourself, please try to collect more information about your destinations before your departure. 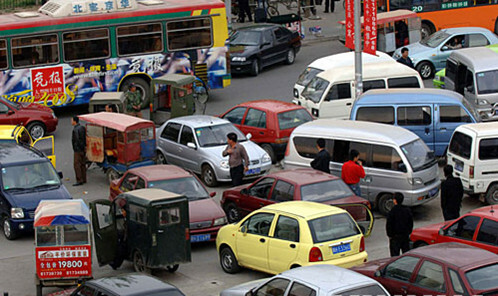 Black doesn’t mean that color of the taxis is black, but refers to the illegal taxis or cars that can be found all over China. You may encounter them near almost every tourist attraction, as well as airport, the city center or hotel. Only the drivers of “Black” Taxis have time to approach you and ask you “where are you going”. Some of these drivers will not only overcharge you but some of them will take you into the middle of nowhere where several of the black taxi drivers friend showed up and took all of the tourists belongings. Very common to see in tourist-heavy area of largest cities in China, such as the Bund of Shanghai, the Tian’anmen Square of Beijing, the City Wall of Xian, etc. Usually, an attractive male or female will approach you and offer to be a free tour guide. Later, they may actually take you to a place or two with the name of very typical, very nice or very unique, all the while learning more about you to find the best way to get your money. Please remember, there is no free lunch in the world. Some people on streets approaching the tourists and offer them many cheap tours, however, most of the attractions are squeezed into fewer time, and their only interests is taking you to shopping places and force you to bug a lot of things which you don’t want to buy. Besides, the services are not guaranteed. Even you complained to related authority, you will find the truth it is hard to find this so called great travel agent. Sometimes, while you are touring in China alone, one person may approach you with in fluent English, he/she is friendly to you and teaches you a lot of the local customs, shows you around, and finally brings you to a teahouse and helps you order cups of teas. And then, when you are ready to pay the bill, you will find it is a large amount of money for the tea. So, if you are ready to take his/ her friend services, why not check the price of the tea first, and then continue your talk. At some big tourist attractions in China, some young people, says they are “art student”, will approach you. Then show you the art they have allegedly produced. However, this one is usually more of a waste of your time than anything, for they just selling the same “art” everywhere at much higher prices. Pickpockets are very very common to see at tourist attractions, especially near the entrance of the very hot tourist attractions, especially at the Tiananmen Square, near the ticket office of Forbidden City, especially when you are alone in the late evening. Always keep your eyes on your bags, and carry your wallets in a front pocket or a pocket inside your coat will be very useful. A true tour guide will be very useful, for he/she knows how to recognize and turn the pickpockets in to the police. While you are wandering around sone scenic spot, a tout with nice souvenir may attract your attention. You give RMB100 notes to him/her, and he/she gives you a RMB50 and some change to you. Later, when you try to use the RMB 50, some others will tell you that it is fake. So, you’s better bring some small change, buy souvenir from shops, or learn how to distinguish the real and fake RMB. There are always many stalls try to sell the souvenirs in a ridiculous high price inside some scenic spots to visitors, especially to foreign visitors who don’t speak the Chinese. Some of them said it is real antique from Tang or Han dynasties. Please just ignore them. Or you can think about it by yourself, why these stalls don’t sell any souvenirs to Chinese? At some great tourist attractions, some children will beg for money, sometimes even grabbing onto your legs until you pay them some money. There are that these children may have been kidnapped from other places specifically to be used for begging purposes, or some from really poor remote rural areas. If you give one, more will run to you, so, just avoid those child beggars.Besides, if you found someone force this child to beg, you can call 110, the police telephong number.